This page will allow you to access files from a USB external hard drive or thumb drive that is plugged into the D-Link DIR-850L router from your local network or from the Internet using either a web browser or an app for your smartphone or tablet. You can create users to be allowed to access these files. Check to enable sharing files on your USB storage device that is plugged in your router. Enter a port (8181 is default). You will have to enter this port in the URL when connecting to the shared files. For example: (http://192.168.0.1:8181). Enter a port (4433 is default). You will have to enter this port in the URL when connecting to the shared files. For example: (https://192.168.0.1:4433). Check this option the allow remote access to this router. To create a new user, enter a user name. Enter a password for this account. Re-enter the password. Click Add/Edit to create the user. Displays the accounts. 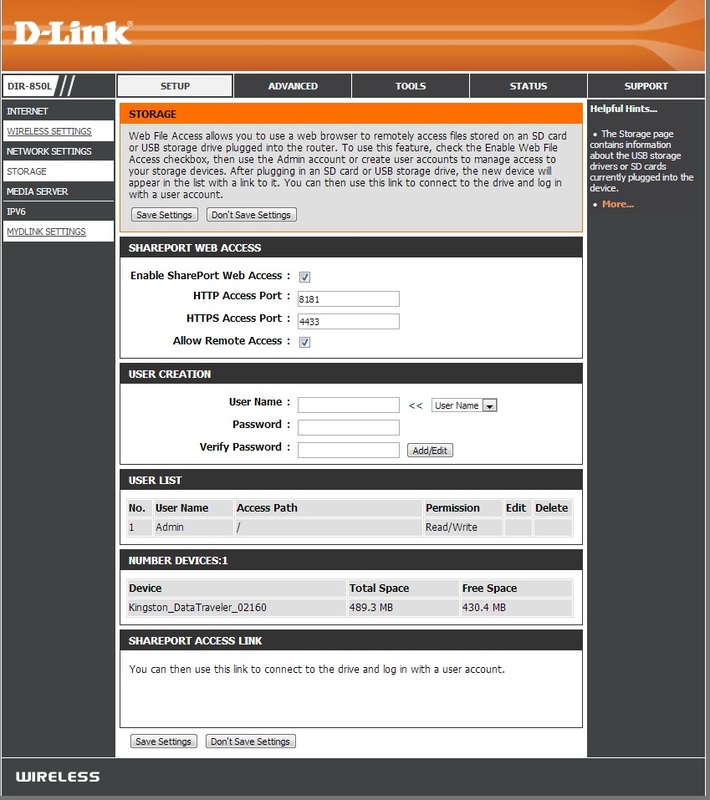 The Admin and Guest accounts are built-in to the router. Displays the USB device plugged into the DIR-850L router. This section will allow you to change the local network settings of the D-Link router DIR-850L and to configure the DHCP settings. Enter the IP address of the router. The default IP address is 192.168.0.1. If you change the IP address, once you click Save Settings, you will need to enter the new IP address in your browser to get back into the configuration utility. Enter the Subnet Mask. The default subnet mask is 255.255.255.0. Enter a name for the router. Enter the Domain name (Optional). Uncheck the box to transfer the DNS server information from your ISP to your computers. If checked, your computers will use the router DIR-850L for a DNS server. DHCP stands for Dynamic Host Control Protocol. The D-Link DIR-850L has a built-in DHCP server. The DHCP Server will automatically assign an IP address to the computers on the LAN/private network. 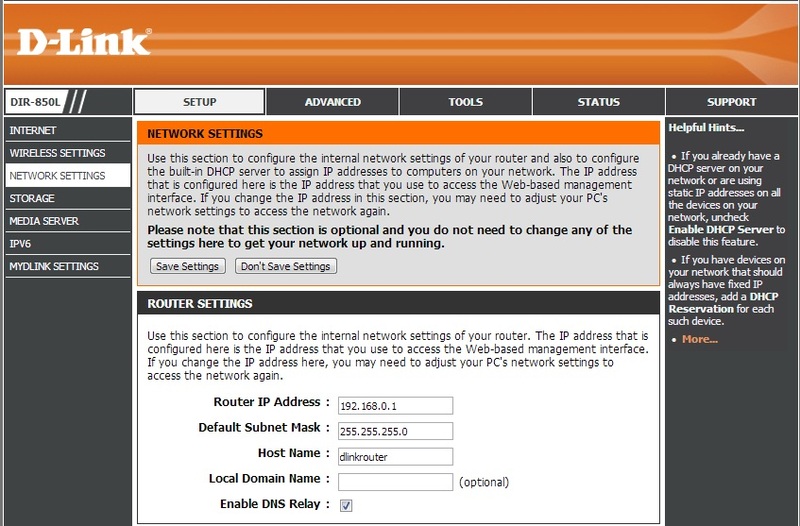 Be sure to set your computers to be DHCP clients by setting their TCP/IP settings to “Obtain an IP Address Automatically.” When you turn your computers on, they will automatically load the proper TCP/IP settings provided by the DIR-850L. 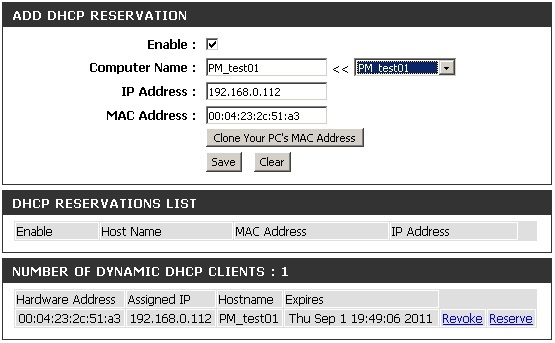 The DHCP Server will automatically allocate an unused IP address from the IP address pool to the requesting computer. You must specify the starting and ending address of the IP address pool. Check this box to enable the DHCP server on your router. Uncheck to disable this function. Enter the starting and ending IP addresses for the DHCP server’s IP assignment. Note: If you statically (manually) assign IP addresses to your computers or devices, make sure the IP addresses are outside of this range or you may have an IP conflict. The length of time for the IP address lease. Enter the Lease time in minutes. 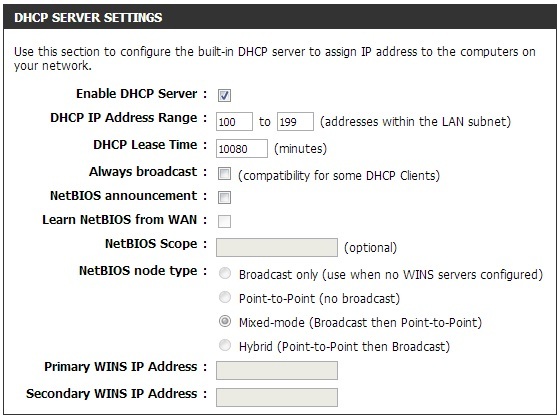 Enable this feature to broadcast your DHCP server to LAN/WLAN clients. Server to offer NetBIOS configuration settings. Enable this feature to allow WINS information to be learned from the WAN side; disable to allow manual configuration. This feature allows the configuration of a NetBIOS ‘domain’ name under which network hosts operates. This setting has no effect if the ‘Learn NetBIOS information from WAN’ is activated. If you want a computer or device to always have the same IP address assigned, you can create a DHCP reservation. The router will assign the IP address only to that computer or device. Note: This IP address must be within the DHCP IP Address Range. Enable:Check this box to enable the reservation. Enter the computer name or select from the drop-down menu and click <<. Enter the IP address you want to assign to the computer or device. This IP Address must be within the DHCP IP Address Range. Enter the MAC address of the computer or device. You can use the Clone Your PC’s MAC Address button to replace the Internet port’s MAC address with the MAC address of your Ethernet card. Click Save to save your entry. You must click Save Settings at the top to activate your reservations. Today’s households are connecting more devices than ever before – with more and more iPhones, Androids, tablets, and laptops laying around in any given home, it’s important that each device gets the speed and coverage it deserves. By upgrading your current network to AC with the DIR-850L, you can immediately enjoy the benefits of faster wireless speeds, increased home coverage – all with less wireless interference so you can enjoy doing what you love most. Delivering Wi-Fi dual band speeds of up to 1200Mbps, the DIR-850L is the perfect solution for those looking to enjoy smooth gaming, high-quality HD video streaming and fast file transfers. While the DIR-850L delivers AC performance to your home network, it is also backward compatible with all of your existing 802.11 wireless devices. This means you can enjoy all the benefits of wireless AC without worrying about annoying compatibility issues. Simply use a browser or download the QRS app to your mobile device, follow the intuitive setup wizard, and you’ll have your wireless AC home network up and running in minutes. While your new AC router delivers the latest and the greatest in wireless performance, you can further optimize your home network’s performance by upgrading to an 802.11ac USB adapter on your desktop and laptop computers. By adding D-Link’s AC1200 USB adapter (DWA-182) to your AC network, you can avoid speed bottle-necks and ensure that your network is running at it’s full potential. The DIR-850L delivers Dual Band performance for intelligent, versatile, interference-free bandwidth. Check your email and surf the Internet on the 2.4GHz band; and game, make Skype calls and stream HD movies to multiple devices using the cleaner, interference-free band.